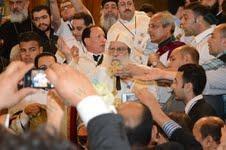 Today Friday 27 April has seen the door officially open for the nomination of candidates for the post of patriarch of the Coptic Orthodox Church, in the wake of the passing away of Pope Shenouda III at age 89 on 17 March. The official mourning period—40 days—for the late pope ended on Thursday 26 April. Nominations will be open till 17 May. A candidate may be nominated by six members of the Holy Synod or 12 members of the Melli (Community) Council. In a move which took everyone by surprise, the locum tenens, acting patriarch, Anba Pachomeus Archbishop of Beheira was nominated by more than 50 members of the Holy Synod; and Anba Moussa Bishop of Youth was nominated by some 30 members. Both Anba Pachomeus, 77, and Anba Moussa, 74, had declared they refrain from candidacy for the papacy; the former because he wished to remain directly in charge of his parish, and the latter for health reasons. Nominations were also submitted for Bishop-General Anba Yu’annis, Archbishop of Dumyat Anba Bishoi, and Bishop of Samalout Anba Pavnotius. In case Anba Pachomeus accepts nomination for patriarch he may have to give up his current responsibility as acting patriarch to the second oldest member of the Holy Synod after him, that being Anba Wissa of al-Kosheh or, following him, Anba Hedra of Aswan.